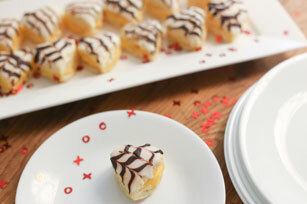 Baked puff pastry hearts are split and filled with almond-flavoured pudding. For a pretty touch, the tops are glazed then decorated with chocolate. Unroll 1 pastry sheet; cut into 12 hearts with 2-inch cookie cutter. Place, 2 inches apart, on baking sheet. Repeat on second baking sheet with remaining pastry sheet. Bake 20 min. or until golden brown. Cool 1 min. on baking sheets. Remove to wire racks; cool completely. Meanwhile, beat pudding mix, half-and-half, and extract with whisk 2 min. Refrigerate until ready to use. Melt chocolate as directed on package. Split pastry hearts horizontally in half; fill with pudding mixture, adding about 1 Tbsp. to each. Mix sugar and hot water until blended; spread onto tops of hearts. Let stand until almost set. Drizzle with chocolate; swirl gently with toothpick. Garnish with small fresh strawberries before serving. When serving adults, substitute 2 Tbsp. almond-flavoured liqueur for the almond extract, if desired. If glaze becomes too thick, gradually stir in additional hot water until glaze is of desired consistency.